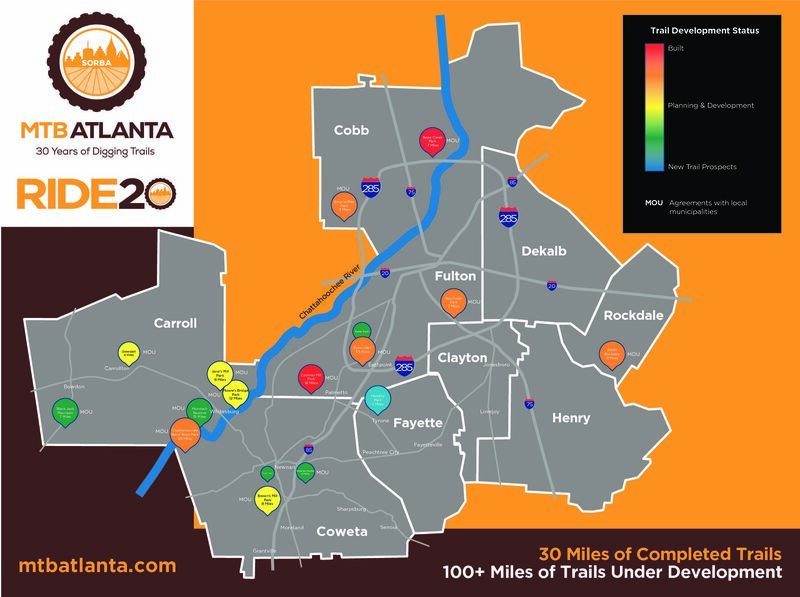 It has been a banner year for access and development at MTB Atlanta and as we move into the build season, we wanted to share our successes and this map of our plans with you. We have a new initiative that we have named “Ride 20.” We believe every Metro Atlanta resident should be no more than 20 minutes from a natural surface trail for mountain biking or a bike park or pump track. As an organization, we aim to seek out opportunities for soft surfaced trails and bike park and pump track facilities in communities that are underserved for mountain biking, outdoor recreation and sustainable, well designed, soft surfaced natural trail systems. Much great work has been done by our cousin Metro Atlanta SORBA Chapters like SORBA Woodstock, RAMBO, GATR, and SORBA West Georgia towards this end. We intend to fill the voids. This year we have forged new partnerships and gained new access in the cities of Newnan, Carrollton and College Park, and in Coweta and Carroll counties. We have had Memorandum of Understandings (the agreements on which access is secured and trail projects are built with permission from land managers) approved by the City Council of Newnan, the City Council of College Park, and the County Commissions of Carroll and Coweta counties. We currently have active trail build projects at Southside Park in Atlanta, South Rockdale Park in Rockdale County, Chattahoochee Bend State Park in Coweta County, and Sykes Park in East Point. We are meeting to plan two bike park projects in Newnan and East Point and have supported the new Smyrna Bike Park project at North Cooper Lake Park. We are in the planning stages at Moore’s Bridge Park and Jones Mill Park in Carroll County, working on flagging phase 3 and 4 at Chattahoochee Bend State Park, and planning pocket park trail development along the Carrollton Greenbelt. Let us know your feedback, and if you know of any opportunities for trail, bike park, or pump track development in the Metro, contact sorbabrett@gmail.com. As always, support our work by joining or renewing your membership today at https://www.imba.com/renew/chapter/210548 , donating to our trail fund at http://mtbatlanta.com/double-down-fund/ or volunteering at one of our work parties http://mtbatlanta.com/events/.